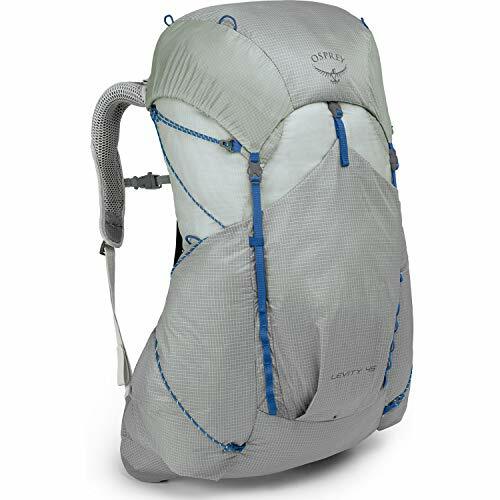 The Osprey Levity is an ultralight backpack available in a 60L or 45L size that weighs under 2 pounds. Much-anticipated, the Levity packs are one of the first ventilated ultralight backpacks available with a suspended mesh backs to help keep you cooler and drier while backpacking. 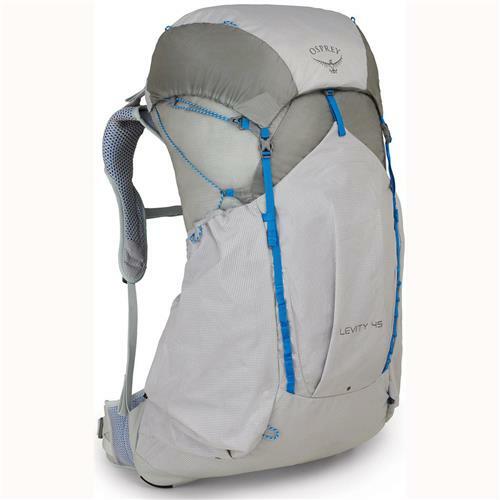 The Osprey Levity is an ultralight backpack available in a 60L or 45L size and weighing just under 2 lbs. Much-anticipated, the Levity packs are one of the first ventilated ultralight backpacks available with a suspended mesh backs to help keep you cooler and drier while backpacking. Ventilated backpacks have their strengths and weaknesses, which I’ll elaborate on below. But other than the use of lightweight fabrics, the Levity backpacks aren’t a radical departure from Osprey’s other backpacks and will be easy to switch to if you’re already an Osprey pack owner, without having to radically change your gear list or style of backpacking. Osprey’s always had a problem with the accuracy of their size specifications, particularly when it comes to backpacks with fixed length torsos and hip belts, and the sizing specifications for the Levity are no different. My advice for you is to buy one size larger than you think you need. The Levity runs small. SIZE UP! In addition, if the ends of the hip belt wings (not the webbing) do not cover your front hip bones, this pack is too small, and your shoulders will suffer from the extra weight when you load it up. The Levity is pretty much what you’d expect an Osprey ultralight backpack to look like with a fixed top lid pocket, draw string closure, fixed length hip belt, side water bottle pockets, and an open front pocket. Although the Levity 60L and 45L don’t have any hip belt or shoulder strap pockets, like the new 2018 Osprey Exos (see review) which is also missing them. There’s no mesh on the side or front pockets on the Levity to tear, adding considerably to the pack’s durability. The Levity’s main compartment is enormous, especially on the 60L backpack, and it can fit lots of gear. 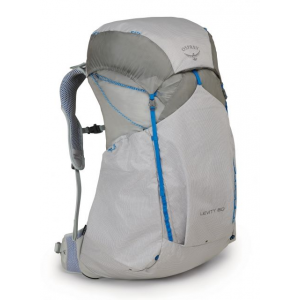 It’s made with a nearly transparent 30d silnylon which lets a lot of light into the pack so you can find stuff. The main compartment is shielded on three sides by dual side pockets and a large front pocket, which are all made with reinforced solid 210d fabric and protect the inner silnylon bag. However, the curve of the ventilated back makes the Levity considerably more difficult to pack efficiently than backpacks with more rectangular main compartments. This is true of both sizes, the 60L and 45L versions of the pack. The top lid has one deep pocket and is fixed to the pack, unlike a floating lid that you can raise if you need to overstuff the main compartment. That’s a strength in my book, because the pocket doesn’t flop awkwardly back when it’s overloaded like it does on many packs with top lids, and pull you backward. Both the 60L and the 45L carry very “wide,” especially when you pack water or gear into the bulging side pockets. They remind me of hamster cheeks. The side water bottle pockets are quite large and can each store 2 x one liter bottles. They have slits along the front (facing your back) so you can pull a bottle out if you want a drink. However, there’s no way to put a water bottle back into the side pockets while wearing the 60L or 45L sized pack, because the side pockets are too tall and it’s too difficult to re-insert a bottle into a front slit. There is an internal reservoir pocket inside the pack with a single hand loop, and centrally located hydration port, between your shoulders if you want to use a hydration system. There’s also a large shovel-type front pocket on the Levity that’s ideal for stuffing layers into, wet gear, or items you want fast access to during the day. The Levity packs have z-style side compression system that uses a thin reflective cord and its primary purpose is to pull the front of the pack closer to your back. It doesn’t do a terribly good job of this because there are so many direction changes along the length of the cord. These limit your ability to target extra compression at different points inside the main compartment where you might have a bulging sleeping bag or shelter. The side compression cords are also quite long and have a tendency to extend beyond the sides of the lid so they catch on overhanging vegetation. The other problem with a z-style compression system is that it’s hard to attach bulky objects like snowshoes to the side of a backpack. 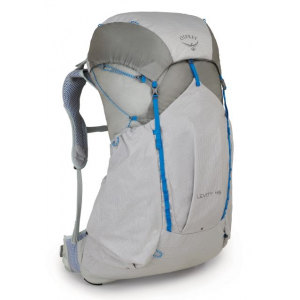 Osprey has to use this kind of system on the Levity packs because the side pockets are so tall, but they’re not as functional as several tiers of horizontal, webbing-style compression straps. The front pocket has two thin daisy chains running down its side that can be used to lash extra gear to the pack. While there aren’t distinct sleeping bags straps like on the 2018 Exos, there are exposed gear loops that can be used to tie a sleeping pad or tent body to the bottom of the pack. The Levity is a ventilated backpack with a perimeter wire frame and suspended mesh back panel. The frame is quite springy and has a lot of lateral flex (bounce even) to it, but like many ventilated backpacks, it has a tendency to pull you backwards onto your heels because the back is so sharply concave. While load lifters help to correct this back tilt, the effect is still quite noticeable. While the Levity is ventilated (and uses the same frame as the Exos 2018), the mesh is not as supportive or hugging as the Anti-Gravity ventilated mesh found on the Osprey Atmos AG or Aether AG backpacks, which have much sturdier hip belts and wider spaced mesh. The Levity hip belt is lightly padded and provides surprisingly little load transfer to the hips, in part because it has holes cut out in the rear which reduce the amount of surface contact between the pack and your hips. If you prefer backpacks with pre-curved and sculpted padding, you’re not going to like the Levity very much. The hip belt sizing is also noticeably short, as noted above, a common problem with Osprey fixed length backpacks. When filled, the curved frame directs the force of the load onto the back of the hips and lumbar area of your back, but far less so on the side or front hip bones. This is very different than most the ultralight backpacks because they’re straight-backed or have a shallower curve that’s closer to the spine and hips. The difference doesn’t matter that much for a backpack with a max load of 30 pounds or less, but it is still noticeable. Carry wise, both the Levity 60L and 45L feel very “wide” and less nimble than a backpack with a narrow main compartment, although the 45L is considerably fleeter of foot than the 60L pack. The wider feel comes in part from the unstructured, extra-wide, side pockets, which do less to compress or stabilize gear stored in them than packs with stretchy side pockets. If your load volume is small enough, I’d encourage you to get the 45L which still has plenty of capacity, but has shorter and smaller volume side pockets than the 60L Levity. The Osprey Levity 60L and 45L backpacks weigh less than 2 pounds and are one of the few ventilated ultralight backpack options available today. Both packs are designed for durability with a noticeable absence of the external mesh, which is so notorious for getting ripped up on Osprey Packs. External daisy chains and gear loops allow plenty of gear attachment and customization options while a large top lid pocket provides excellent external gear storage. While the design of the ultralight Osprey Levity 60L and 45L backpack is not earth shatteringly new, they’re both excellent choices if having a ventilated, suspended mesh back is at the top of your priority list. Equally exciting is the fact that you’ll be able to try on and fit the Levity ultralight backpacks on in retail stores, which should help to further demystify and accelerate the backpacking industry’s development and adoption of lighter weight outdoor gear. Disclosure: The author purchased these products with his own funds. You need to but the external frame back on the packs…this experiment has failed we need to get on with with the real backpacks . . .
1. What is the load bearing capability for this pack? Do you agree? (Couldn’t find it). 2. In your opinion, how does this pack compare to the GG Mariposa which you reviewed (Couldn’t find the date of the review). 3. Please compare this pack to the Osprey Exos … is the weight reduction worth the loss of features/capability in your opinion? 1. It’s listed in “specs at a glance” – yeah, that’s about right for a perimeter wire frame and a minimal hip belt. Answer: Depends what you’re looking for. I personally don’t care about back sweat and think the Mariposa is easier to use, but have grown to dislike the long Mariposa side pocket, which is really only good if you carry a proper tent (which I don’t). I think the Silverback is a much better pack and the Silverback 2018 is going to be a roll top when it arrives in inventory, I’m told. 3. No. The Exos is a marginally better pack, although less durable, because the external storage is less “floppy”. But you can’t reinsert water bottles in the Exos side pockets either. Let’s just say I’m underwhelmed by both packs, but if you have your heart set on an Osprey ventilated pack, they’re both well suited for that purpose. What percentage of your reviews in the last year are between 4 and 5 stars? I’d guess 95-100% of your reviews are between 4 and 5 stars. I never said your audience was ultralight backpackers and I never said you should write more concise reviews. I’m talking about your propensity for only rating gear between 4 and 5 stars. If you’d like to discuss this backpack, I’m happy to engage in a discussion. I’m not in the business of trying to trick my readers, as you seem to be implying. What I try to do is tell my audience about the best products available today. After writing over 1000 product reviews you get pretty good at spotting duds and can avoid wasting your time on them. This looks a bit like the REi Flash 45 but about a pound lighter and $100 more. Would you say the Flash is more comfortable? Which would you prefer a 3-4 days? Read my flash 45 review. They’re pretty different packs. I’d prefer the flash 45 because it sits closer to my back. Thanks for the review Phil. The Exos 48 et and Levity 45 are respectively advertised to have a carrying capacities of up to 40 lbs and 25 lbs. Since you’ve tested both packs, can you tell us if the carrying capacity of the Exos really seems to be that much more the Levity’s? Both packs have identical suspension systems. Same frame, hipbelt, and mesh. Not sure how they can be that different. I recall reading somewhere that the Exos has sturdier shoulder straps and hip belt. That would allow it to carry more weight. Osprey even lowered the advertised max load of the levity 45 to 20 lbs. That seems way too low for a 45 liters pack to be useful. I suspect it is not because of the suspension, but because of the silnylon main body fabric, which might not be strong enough to consistently hold more without tearing. That is news. Have to wonder about that! 20 pounds is the max recommended load for a FRAMELESS backpack. But I doubt the problem is the silnylon. People have been making silnylon backpacks for a long time that can carry 30 pounds loads or more. Not sure I follow your train of thought. I periodically publish gear lists and have a gear closet section so you can see what gear I prefer to carry for personal use on my trips. The trip, terrain, and objectives determine the gear I take from the small list of favorites I own. This was Exactly my point. in rebuttal to Peter S comments. point being you review and rate gear for your followers and not just give high reviews to what you prefer. Thanks Tom. I was expecting another beat-down. Nice to know some people appreciate my inclusiveness. Zpacks has made a ventilated, framed pack for years. My Arc Haul Zip is lighter(27.5oz), has greater capacity(64L), is rated for more weight (40lbs), and doesn’t assume my back is the shape of a box turtle :) With Zpacks, you can keep it flat or arc it to your preference. Have a great hike.The Circuit is a great pack. We live in an era of great pack choices, I must say. Someone mentioned the Arc Haul. Im often around 25-30lbs (starting out), currently have an EXOs 58 and dont love it. I find the hip belt wrap not sufficient most of the time, hip and shoulder pockets worthless and the suspension bouncy and squeaky. I dont hate it, but think its just OK. I tried on the Levity 60 at Downworks in Santa Cruz (best gear shop in the Bay Area/CA), and thought it was pretty good. Seems like the vented back panel is set closer to the back than the old EXOs. But really curious how you think this pack compares to the Arc Haul? What do most folks think a reasonably load for the Haul is? I’ve never used an arc haul. Thanks for reviewing this Phil. I finally got to try this out at my local sport store. It’s basically a lighter weight exos58. The compression straps did a terrible job of holding the weight up top and it all sagged to the bottom like a giant potato sack. Maybe it takes the right size and shape stuff bags to compartmentalize the pack, idk, and I don’t want to pay the $ to find out it won’t work. It’s too bad. I have an exos38 which is used for day/overnight trips and I personally think the suspension on it is the best I have ever used. Keep in mind, I have never gone over 17 lbs (standard), 7727 gr (metric). Didn’t get the chance to try a 45 model. Maybe that works better. I have had issues with this rucksack initially (finding the compression system useless and lack of adjustability on the sternum strap). I finally used it today carrying 5kg – 6 kg if that. Firstly, the back system has eaten my lightweight shirt – this was an initial reservation I had about the osprey back system a long time ago, as it looked to harsh for my lightweight clothes and I have also had issues with other ruck sacks that thankfully I managed to resolve. There needs to be padding around the bottom of the frame or at least it needs smoothing out. I am worried about using it with my expensive and very light waterproof. I found it extremely uncomfortable. I am not a sponsored user or magazine who are not going to say anything bad – I’m a regular user and this is my true experience on a 15 mile hill walk – the straps dug into my shoulders and they now hurt. The lack of flexibility to alter sternum strap is just unworkable. The tearing up of my clothes is a real issue for me and sadly this is not the bag for me – I expected so much more, not only from the bag but the brand. Unfortunately for me a dreadful waste of money! Obviously people need to be made aware of the serious limitations of this system rather than listening to people telling you how fantastic it is because in varying degrees of vocabulary – thats what they always say when they review a product. I find the minimal feature set to be one of the best parts about the pack. I really don’t use pockets a lot, but even the minimal pockets on this pack are enough to let me put everything I need on the trail on the outside of the main compartment, and the in-camp stuff inside the main compartment. I appreciate that none of Osprey’s trademark features, like the Stow-on-the-Go, aren’t included – I always found a lot of them contrived and hokey, and usually took them off. I began backpacking when there was no such thing as hipbelt pockets, and just never really used them when I had them. I don’t miss them on this pack. The pack does definitely require you to commit to ultralight gear. I had considered switching to synthetic garments and sleeping bags, for ease of care and cost (fully knowing that the useful life is much less) – but that decision is now made in favor of down, irrevocably. However, there is enough room that, if I want to, I can fit in a Thermarest chair kit as a luxury and not add significant weight. My only real concern is what happens when I have to add an extra two liters of water to carry to a dry camp. However, that’s normally only for a couple of hours – but it’s at the end of the day, generally, when I’m getting tired. I’m pretty confident it will be OK, but it remains to be seen. Overall, I’m excited about this pack – it’s more than 2 pounds lighter than the Atmos AG 50 I’d been using, and is just minimalist enough to please me. Well, my concern turned out to be true. At 17 pounds, it felt pretty good to carry. Then I added 2 extra quarts of water (what I usually carry to a dry camp), and the pack carried like a tired 4-year-old had climbed onto my back – and wasn’t in a particularly good mood. No actual hair-pulling, but the suspension pretty much collapsed, and I couldn’t get weight off my shoulders. The 20 pound weight limit Osprey set appears to be pretty accurate. Much as I wanted to like it, the pack went back (I hadn’t worn it outside yet) and I picked up the new Exos 48. I took it home, loaded it up the same, added the extra water, and the pack carried great. A further note on sizing: I noted previously that the Levity size medium fit me better than a large. In the Exos, I’m back to my old fit: the Large Exos fit me better than the medium. Go figure. In the four or five months since my August 18 post, above, I did some long-term strategizing. I’m almost 69, and as I started thinking about how much longer I wanted to backpack, I decided “at least to 80” made sense. I’ve still got all my original hips and knees, and nothing hurts when I get up in the morning. To make that last, though, I figured out that I needed to lighten my then-current load below the 18-20 pounds I normally carried for a weekend (that includes food, water, and fuel.) After some “strategic” purchases (such as a new tent, sleeping bag, and puffy jacket) and rethinking some other techniques, I got down close to 14 pounds; winter clothing and a warmer bag added 2-3 pounds. At that point, I knew I could stay under the 20-pound limit of the Levity pack in nearly all conditions I’d choose to be out in, so I bought another Levity 45 – this time in size L. That saved another pound, and cinched the deal. I did notice I had to tighten the hipbelt a bit more than I did with the Exos; however, it wasn’t enough to leave marks, and it didn’t feel constricted – just a bit tighter for about 15 minutes, then I didn’t notice it at all. I might be able to cut another pound off, eventually. I could only afford a 650 down bag and jacket, with all the other gear I replaced. I also kept my “heavy” Platypus gravity water filter system, because I like it; I may eventually cut back to a Sawyer (or, more likely, just switch to chlorine dioxide tablets.) I’m also still using my Titan Kettle/Pocket Rocket kitchen, but I may eventually switch to an alcohol stove like my buddy has. But for now, the Levity is looking more and more like a keeper. Thanks for sharing your experience. Sounds like you’re doing everything right to me! I’m even a little envious. Just had a quick try of the 45. I was interested to see what a mainstream brand would make of an ultraliht pack. But similar to other reviewers, I was decidedly underwhelmed. As Philip points out, the curve of the frame is extreme, and I felt that the load was pulling me backwards. There’s no adjustment so you are stuck with this. Despite the relatively heavy and rigid suspension system the waist belt was collapsing with a 25lb load and most of the weight was on my shoulders. The side pockets are far taller than than they need to be. A couple of us tried, and it’s literally impossible to get a water bottle in and out while on the move. We couldn’t make sense of the side opening half way up the pocket – with some contortions you could get the bottle out, but we couldn’t figure out a way to get it back in. So this pack is really only viable if you use a hydration bladder. Like everyone else, we found the compression system inadequate. And the liberal use of 30d silnylon on the sides looked extremely vulnerable – the merest brush of a branch or rock and it’s going to rip. So really only suited for groomed trails – any kind of scrambling or bushwhacking, even over windfall, and you’re asking for trouble. As Philip says, only worth of consideration if a suspension frame is your absolute top priority. There are better options in this weight band.